We have different options to fit any catering or party need. Check them out below! Let your guests, clients, or party-goers build their own delicious sandwiches or bowls! First, choose what style — bowl, sandwich, or a combination of both. Then, pick a protein, vegetables, or a mix of both, from the menu and tell us how many people you’re feeding. We’ll whip up a build that’s just right for your group. Starts at $7-$10/person. Service charge/Utensil fee not included. Know exactly which sandwich or bowl you and your guests enjoy? Setting up in a space that doesn’t have room for a spread? Try our Lunch Box Set and mix and match between any of our Sandwiches or Bowls on our menu. Every set comes with Chips, and house-made pickles. 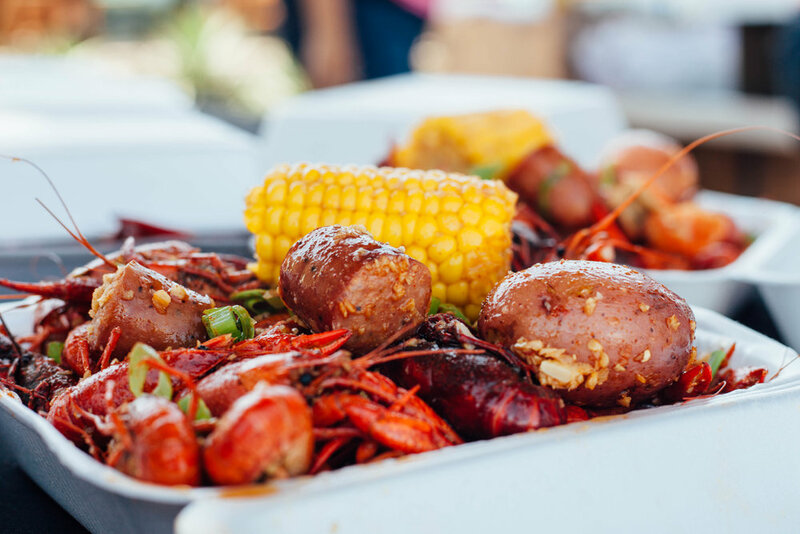 Whether you’re celebrating a birthday, or watching the big game, this is the perfect way to experience a classic Viet-Cajun seafood boil. Choose from a selection of fresh, seasonal seafood, and we’ll boil it up for you! Each Signature Boil comes with: your choice of spice and sauce — OG Garlic Butter, Coconut Curry, or Dragon, and includes all our boil sides — potato, corn & sausage. Starts at $15-$20/person. Service charge/Utensil fee not included. Craving the full Pinch experience? Want a little bit of everything? Well, look no further. With this option, you’ll experience: fresh seasonal seafood covered in a delicious sauce of your choice, your favorite bowls/sandwiches, street food skewers/wings, and a fresh salad option. You can also leave it up to us, and we’ll design and suggest an ultimate feast just for you! Starts at $20-$30/person. Service charge/Utensil fee not included. Don’t see anything that fits what you’re looking for? Shoot us an email, and we’ll be happy to work with you to find a custom option! Whether you’d like for us to come up with a fun menu, or if you have a couple ideas, don’t hesitate to let us know!